Lots of things happening here, so I’d better get on explaining them all! The weather is still lovely – apart from the odd thunderstorm it’s been sunny and warm, a bit chilly at night, but still t-shirt weather during the day, which is nice! I was feeling a bit claustrophobic last week, as the initial excitement had worn off and I was starting to get a bit frustrated when I couldn’t understand anything, and no-one could understand me. However, on Friday we had a celebration to mark the beginning of Dashain, the biggest festival of the year, and Aamaa invited lots of her friends who have helped her financially over the last two years, as it was also the 2nd anniversary of the orphanage. We put on a little program, the kids sang some songs and danced, and I made a short speech. It was all very nice. Then on Saturday I went to visit my friend Alan, who lives outside the city in a much more rural area south of Kathmandu. It was just what I needed, as I hadn’t realised how much I’d missed fresh air and greenery, so we had a nice walk and took in the stunning scenery. 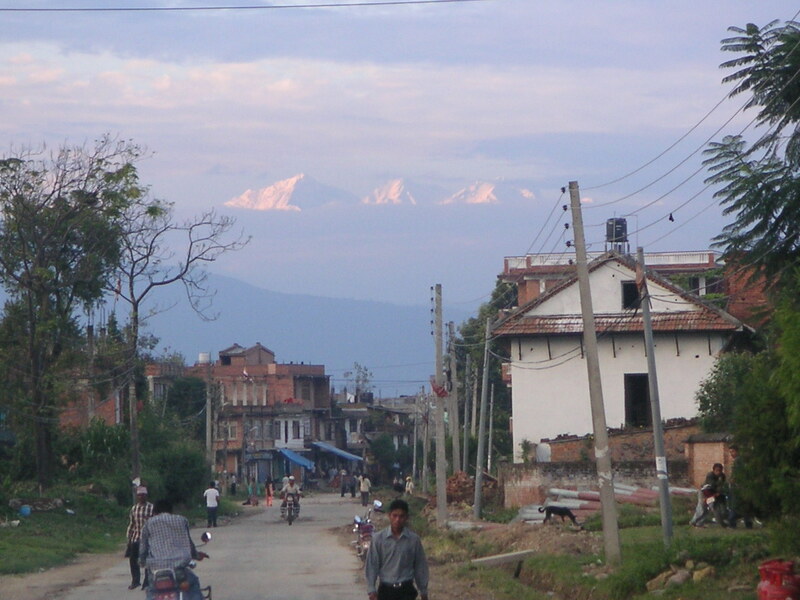 Then on our way back towards the village, the sun was going down and the clouds ahead dropped, and I saw the Himalayas for the first time. They were incredible (pictures to follow) and looked like a mirage, floating in the sky – the clouds below cut them off from the earth completely. They were snow-capped and majestic and rocky and everything I’d expected them to be! So, I came back feeling very refreshed and relaxed, and have resolved to get out of the city more often – I’m even thinking of renting a bike to cycle around a bit from time to time! I’m also proud to announce that I have lost 6 kilos on my “dhaal bhaat” diet, so I’m a bit chuffed with myself! This week has so far been very quiet, as it’s a holiday, so school’s been mostly cancelled, and lots of the kids have gone away, either to stay with relatives or with friends of Aamaa. So, it’s a nice, quiet, holiday atmosphere, and yesterday I took 7 of the older kids down to the park to watch Anil playing in a local cricket tournament. It was nice to get out, and the kids loved it. I enjoyed it too, surprisingly, as it was only an hour and a half long, which for cricket is pretty good as far as I’m concerned! They only had 8 players on each team, and they weren’t terribly good, but they had to keep suspending play while they hunted for the ball among the maize and sugar cane at the side of the field, or whenever cows wandered onto the pitch by accident! Anil’s team lost unfortunately, but he’s playing in the final today anyway, as apparently he’s also on another team to make up numbers! This morning Aamaa presented me with a beautiful white kurta, one of her old ones that’s too small for her, which is lovely. I’m going to have to get it adjusted slightly, but it’s really sweet of her, and I’m terrified of getting it dirty! Then we went together on the bus to the big temple a couple of suburbs over, and I took pictures while Aamaa made her devotions etc. Since Friday we are in the “nine-day” phase of Dashain, one day to celebrate each of the nine goddesses who are various different incarnations of the goddess Laxmi/Durga, (goddess of wealth). I think. After that there’s some serious slaughtering of different animals, possibly for Shiva, who seems to be the most bloodthirsty of the gods, although I’m not sure. I’m trying to learn a bit about Hinduism, but there are so many gods to keep track of I’m not doing terribly well! I know Shiva is one of the major gods, and is in charge of war and destruction etc. – all the big stuff, and is mostly depicted as big, muscly, angry and blue. (Don’t ask me why he’s always blue!). Then there’s Vishnu, who’s pretty important, but he has 10 different incarnations, mostly animal related, so at any given time he could be the monkey-god, or snake-god, or bull-god etc. One of his incarnations is also as Buddha, which makes things even more confusing! Krishna’s in there somewhere, but he may also be blue most of the time, which gets me confused. At the temple however, it was really interesting to watch all the ritual that goes into praying. I always thought the Catholics had a fair bit of ritual, but this is something else. First you buy flowers, incense and tikka, and then you have to enter the temple and go around clock-wise, putting tikka and flowers on all of the statues of the gods, touching their head and feet, then your head, occasionally touching your head to a random piece of stone, ringing all the bells as you go along. 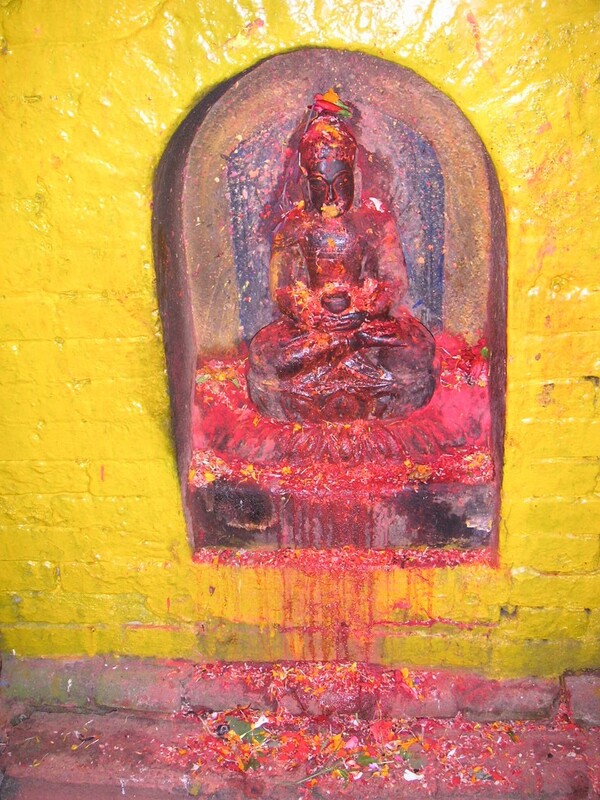 Most of the statues are so covered in bright red, orange and yellow tikka that it has dripped down towards the ground, especially if it has just rained, making them look disconcertingly like they’re bleeding. As I was wearing a kurta and hadn’t yet spoken to them, they stared at me in awe after that, not quite sure whether to believe Aamaa or not! We had a good chuckle as we walked around after that, although I was rather preoccupied trying not to get any of the tikka that was everywhere all over my nice new white kurta! On the political front, the teenage sulking by the Maoists has had an effect, and after an emergency meeting all the parties agreed that whoever got voted in would make Nepal a republic, to try and appease them, but that apparently wasn’t good enough and the election has now been cancelled until further notice. People are rather angry and upset, but the Maoists, in an attempt to do something with all this going on, have asked for a referendum to abolish the monarchy. No idea how that’s going to go, but we’ll see. Thank you to all of you who’ve been asking me about Jeetu, the boy who ran away. I’m afraid we’ve still heard nothing, and the social worker who went to his village said no one there had seen him. So, either he changed his mind and went somewhere else, or something happened along the way. I very much doubt that we’ll hear anything at all about him now, although all we can do is hope that he’s alright, wherever he is. That’s probably it for now, if I write any more you may all collapse into computer-related comas and I’ll never hear the end of it!